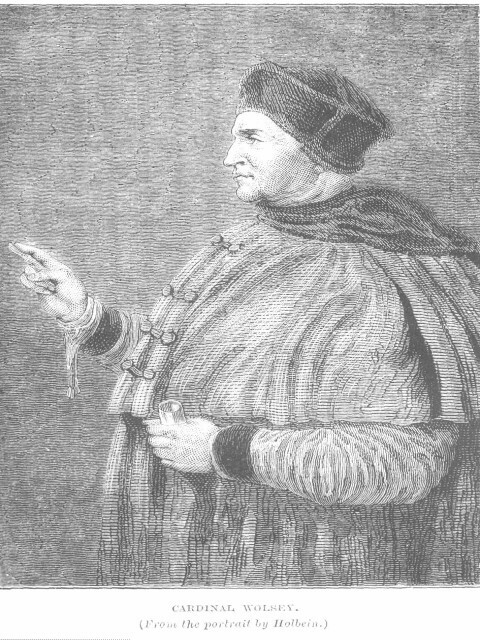 Thomas Wolsey was the son of a butcher in Ipswich who made his way through Oxford before gaining the support of Sir Richard Nanfan, treasurer of Calais, to obtain employment as King Henry`s almoner. But ambition drove Wolsey to seek the friendship of those around the king. These included the Bishop of Windsor, the Privy Seal, who spoke well of Wolsey in the kings hearing. Wolseys` opportunity to impress soon arrived when he was despatched to the Emperor Maxmillian who was in Flanders. In an incredible journey, for those days, Wolsey went from Richmond at noon, to London (4pm), Gravesend (7pm), Travelled all night to catch the morning packet ship from Dover and arrived, via Calais and Paris, before Maxmillian in the evening. Having obtained what was required he returned by night and was back in Richmond just three days and a few hours after leaving. Henry, on seeing him, asked why he had not started out on his journey, to which Wolsey replied that he had returned and placed letters from Maxmillian in Henry`s hand. He had made his mark and his fortune. enabled him to build grand palaces such as Hampton Court. when it was an option he considered to remove Clement VII. His career in full flow, money flowed into his coffers from home and abroad and in no time he was yielding to his dominant vices – ostentation and pride. When appearing in public for example, he was preceded by two of the tallest (and comeliest) priests he could find, each bearing a large silver cross, one for his Archbishopcy and the other for Papal Legate. It is said that he had more than 500 servants including several titled lords, and he personally dressed in scarlet velvet and silk, with matching hat and gloves. His shoes were embroidered with gold and silver, inlaid with pearls and precious stones. To some people it seemed that a kind of papacy was being created in England. He was well advised of all that went on through a network of spies in every quarter. There was little that happened at Court that he did not know about within hours. thus wrote D`Aubigne in his History of the Reformation. Wolsey`s overbearing mien encouraged the priests and clerics to push the boundaries against heresy and were given the chance to test their power when laws were passed in 1513 that any cleric charged with theft or murder should be tried by the secular courts. Representations to Henry “Touch not the Lord`s anointed” said Wolsey, were quickly rebuffed – “Therefore know you well that we will maintain the right of our crown.” Finding they could not overpower the Parliament ( or the king) the clerics once again turned their gaze towards easier prey and the catch all `Lollards`. For Wolsey this episode served to confirm to him that the church needed to be modernised and reformed; the perceived excesses seen to be dealt with. If this work was to progress it would be better that the church itself dealt with it, rather than leave it to secular forces to carve it up willy nilly. task of trying to serve two masters and to preserve papacy in England. For a number of years Wolsey reigned (not too strong a word) supreme and delivered good service to the King Henry through his undoubted diplomacy. Described as a `political artist` Wolsey was a man who dealt with the `today` issues and did not dwell long on future possibilities; his greatest asset was his capacity for work and the ability to handle many disparate issues at the same time. plans all hung together and he used each advantage which he gained as a means of strengthening England’s position for some future undertaking. He had a clear view of the future as a whole; he knew not only what he wished to make of England but of Europe as well. He never worked at a questiou from one motive only; what failed for one purpose was made useful for another. All that was best, and all that was worst, in Wolsey sprang from this exceptional attitude towards statecraft, which he practised with enthnsiasm, – not in the spirit of cold calculation. When he was restricted to the small matter of the divorce his hand lost its cunning. He was, though he probably did not know it, fitted to serve England, but not fitted to serve the English king. He had the aims of a national statesman, not of a royal servant. he owed his introduction to politics solely to royal favour, and conld not obtain any other warrant for his position. For good or evil England was identified with her king, In Henry VIII there was a vivid and dominant character who could be petulant and cruel; an absolute monarch whose will would be done, or he would want to know why There was no option, what Henry desired was to be obtained regardless of cost – whether in money or people. Force majeure therefore Wolsey`s political life depended on the king’s goodwill. Henry was to him a symbol of all that was best and most intelligent in England. Wolsey`s deviations from his own policy in obedience to the king were not more degrading or more inevitable than are the calculations of the modern statesman about the exact limits of the field of practical politics. There is nothing intrinsically base in Wolsey’s subservience to the royal will than in the efforts of modem statesmen to bid against one another for an opportunity of carrying out what they think is the will of the people. writ of praemunire against him was dropped. of 29 November 1530, a broken and dejected man. He lies buried at the abbey.